Lake Akkem (lower right), at the base of Mt. Belukha. The Golden Mountains of Altai is a region with high plant diversity in Southern Siberia. The mountains have several undisturbed glaciers and provide the source of main rivers like the Ob. 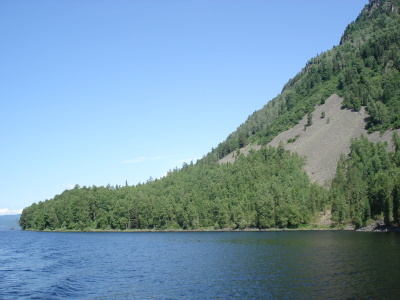 It also holds Teletskoye Lake, the second largest of Siberia after Lake Baikal. The mountains are the habitat of several globally endangered mammals, such as the snow leopard and the Altai argali. A key reason for the pristine condition of Altai has been the careful stewardship by the aboriginal Altai people. A million tourists per summer, escalating ethnic Russian immigration, bungled federal land privatization, aggressive commercial development projects, helicopter poaching by high officials, and the legacy of Soviet repression have significantly subverted the local ability to even maintain their own culture, and the environment has suffered significantly. As far as I have been able to ascertain, the UNESCO World Heritage Site status is unfunded, and has not been sufficient to protect these incredible lands. An indigenous Altai cultural resurgence is underway, and global concern is building as numerous international organizations are formed, dedicated to the protection of both the natural and the extraordinary cultural legacy of Altai. I invite correspondence from anyone who is interested. Viewed just Teleckoje Lake and a small part of Altaiski Reserve (zapoviednik) but I must admit it is area of outstanding beauty. High mountains, nature not touched by human population, deep lakes and landscapes similar to fiords in Norway. Clear water, no pollution whatsoever, you can use accommodation in Artybash village or some cottages located on Lake shores or even a big camping site on the southern part of Lake. But be sure you reserve that in advance - its quite popular region in the summer so in peak season it may be occupied. One of Russia's must to see. Famous tapestries: The 5th century BC Pazyryk carpet, a product of an Achaemenid carpet production centre, was discovered in 1949 in the Altai Mountains. Glaciers: AB review - "The presence of the high number of undisturbed glaciers in the nominated area makes it significant as a site for assessing the effects of global warming in mountain ecosystems". Potential Transboundary sites: China's "China Altai"